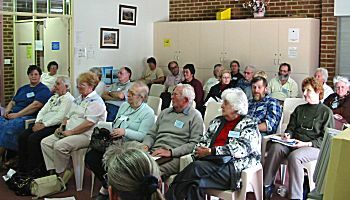 Lake Macquarie Family History Group Inc. The Lake Macquarie Family History Group has a growing list of publications available at the monthly meetings. The Library page has a complete list of current holdings. Books can be borrowed by members. Contact the librarian at the meeting for details. The Group has limited capabilities for carrying out research for non-members. New South Wales 2283 Australia. Research charges are AUD$20 for basic local research which includes limited copying. More extensive and specific documented research is charged at an additional $20 per hour plus copying costs if applicable. The basic research fee together with a large self addresses stamped envelope must accompany any research request. Further details and cost estimates are available from the Research Officer. Donations of suitable books and equipment to the Group to assist members and visitors in their research is most welcome. The Group has computers and microfiche readers to access the records held by the Group on CD ROM and microfiche. Equipment, like books from the library, can be borrowed by members. This kit contains a variety of information sheets, family group sheets, pedigree charts, hints and tips and other information for people undertaking family history research. This kit has been described as 'one of the best on the market' and is available from the Group Bookstall. Group members are an invaluable resource. They have a varied range of experience in a wide range of topics. A buddy system of assistance is available to all members and is a means by which a more experienced researcher provides personal assistance to fellow researchers, be they beginners or experienced, in the field of family history research.